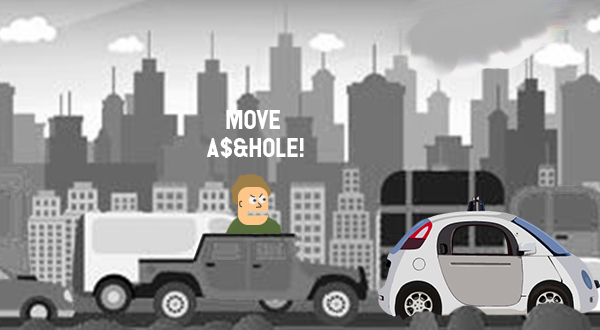 Say it ain’t slow: Are self-driving cars going to make traffic worse? New research in Transport Policy magazine suggests that self-driving cars could more than double the volume of vehicle travel to, from, and inside metropolitan areas. Why? Because autonomous vehicles have no reason to park close to their destination (or at all, for that matter), leading to more cars on the road. Rather than pay for expensive parking in big cities like drivers in normal cars, “AVs can seek out free on-street parking, return home, or cruise” for hours on end. An argument in favor of AVs and ridesharing is that if people are encouraged to use on-demand services instead of owning cars, the total number of vehicle miles driven would fall. But research has already contradicted the theory that ridesharing reduces traffic. Now, early forecasting suggests that self-driving vehicles will have a similar impact. Using “game theoretic framework,” Adam Millard-Ball of the Environmental Studies Department at UC Santa Cruz demonstrates that self-driving cars actually have an incentive to “coordinate with each other in order to generate congestion” to save their owners money. In other words, AVs looking to kill time while their humans are off doing who knows what would love nothing more than a little traffic jam. Ball predicts that even just 2k self-driving cars deployed in San Francisco would slow overall traffic to less than 2 miles per hour. Soooo, time to start riding scooters? Rideshare startups have been leaning into the micromobility game, but many skeptics, including Ball, argue transportation improvements need to come from regulation. Large locales like London, Singapore, and Stockholm impose congestion fees where motorists pay a flat rate to enter the city center, and Ball suggests cities like New York and San Francisco need to implement the same before it’s too late. I know! We’ll build a pit!